We design and specify switching plans and devices for custom lighting systems using Lutron RadioRA 2. In a phone call consultation, we gather information about the client’s goals and priorities. Using a set of prints we create layouts, a bill of materials, and a device installation report. This is everything necessary to purchase and install a Lutron RadioRA 2 lighting system. Purchase design time here. Programming and lighting system design is free when purchased your system from us. See below for details. In rooms with a high density of switch legs (separately switched lights) it’s common to see switch banks containing 4 or more dimmers, which can be unsightly. Using this many dimmers makes it hard to find the right ambient light setting quickly and repeatably. It’s made even worse when there are many switches scattered throughout the room. We solve these problems by replacing large unightly switch boxes with single gang SeeTouch keypads from the Lutron RadioRA 2 family. 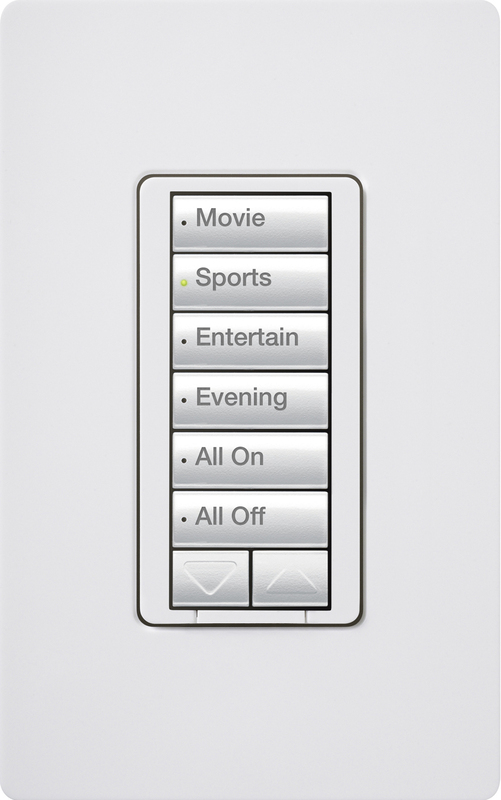 From the SeeTouch keypads, you can recall that perfect lighting scene to either use the room or show it off to friends. It’s a clean look, and easy to use no matter how many switches are in the room and no matter where they are located. Electricians use our layouts to know what size box to place where. The device installation report depicts which devices are installed in each box. The bill of materials ensures that you have everything on hand and ready. Lutron RadioRA 2 offers both manually invoked automated events such as scene selection, events that are automated by time of day, and even by your location if desired. Commonly, we will incorporate all of the exterior lighting so that they can be scheduled by sunrise and sunset. We also use occupancy/vacancy sensors for both energy efficiency and convenience. Wouldn’t it be nice if the hallway lights came on to only 30% brightness during a late night trip to the kitchen? A Lutron RadioRA 2 Connect Bridge enables both local and remote access for the Lutron Connect App. From this app, you can change whole home lighting scenes from your phone, customize them, or even control individual lights. You can also put your home in an “Eco” or “Away” mode. Lastly, you can se lights to automatically come on when you are within a certain radius from the home (like a garage light). We recommend that we professionally program the Radio RA2 system, but the software is also available to any end user that takes a self-paced online course that only takes one afternoon. Programming time is purchase separately from the design, and you can use it how you wish. We can simply program your system for you, or if you’ve taken the class and have the software we can give you a crash course on how to make changes. When purchasing with us, your programming is included. Lutron RadioRA 2 offers both manually invoked automated events such as scene selection, events that are automated by time of day, and even by your location if desired. Commonly, we will incorporate all of the exterior lighting so that they can be scheduled by sunrise and sunset. We also use occupancy/vacancy sensors for both energy efficiency and convenience. Wouldn\’t it be nice if the hallway lights came on to only 30% brightness during a late night trip to the kitchen? We recommend that we professionally program the Radio RA2 system, but the software is also available to any end user that takes a self-paced online course that only takes one afternoon. Programming time is purchase separately from the design, and you can use it how you wish. We can simply program your system for you, or if you\’ve taken the class and have the software we can give you a crash course on how to make changes. We sell Lutron RadioRA 2 products, but there is no obligation to purchase them from us. However, if purchasing a complete system, we offer a 10% discount from MSRP, but even more importantly the equipment will arive pre programmed. The only thing left is to customize some very personal features including schedules and/or lighting scenes, which is also included. When purchasing from us, the amount you paid in design time will be applied to your invoice. This means that design time is included in your purchase. If you do not take the class and download the software, or if your system is beyond 90 devices, your design time will be issued as a refund instead of applied to your payment. This is because we will be sending you a PC so that we can do the programming, and the refund will only be issued after we receive the PC back. Our Lutron Radio RA 2 lighting system design service costs $9.25 per device on the original specification. This means a 100 device system would cost $925. This is a small price to pay to make sure it’s done right the first time, and to make sure you’re taking advantage of all available features. Programming time is purchased separately. Please see our system programming page for the price structure.